Verizon's Droid mobile device was released this week, another strong entry into the smartphone market. And that's one of the reasons Millennial Media (a leading mobile ad firm) is predicting a major surge in mobile ad spend in 2010. The report surveyed 100 leading ad agencies and brands who claim they will increase their mobile ad spending significantly in 2010. 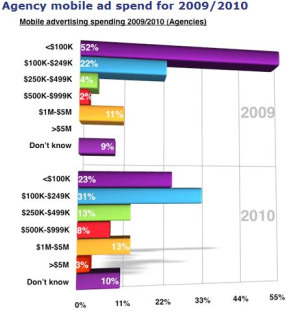 Take a look at the chart here, representing agency responses about their planned mobile ad spend from 2009 to 2010. Across the board, spending can be seen on the rise. Of course, that's one report. But looking further into the matter, Millenial Media is not alone. Gartner released a report in August 2009 that projected a staggering $13 billion in mobile ad spend world-wide by 2013 (a more recent study by PricewaterhouseCoopers puts the figure at $9.2 billion). Why the lofty predictions? Let's go back to the Droid. When you look at the rapid development of smartphones over just the past couple years, it's easy to conclude that mobile usage will boom. The various mobile services will also rise - SMS, mobile browsing and searching, mobile apps, mobile commerce, etc. And where users go, advertising dollars follow. And when ad dollars are at stake, Web developers are quick to bolster their mobile presence. It's a cycle that all leads to an online medium that's ready to take off. The Gartner report, titled "Mobile Advertising Grows Quietly," expects smartphones to account for 45 percent of all mobile sales in 2013 - up from just 9 percent in 2008. So where is the highest growth to be expected for mobile spend? Unsurprisingly, mobile search. And that puts a premium on local advertising as well. A new study from Piper Jaffray (as reported from eMarketer) shows that local online advertising spend is outpacing national online advertising - even surpassing it as early as next year. Perhaps that's due to the Web becoming increasingly localized for consumers - particularly mobile consumers. The predictions from Piper Jaffray are impressive: 2010 U.S. mobile paid search spend will hit $295 million in 2010, then balloon to more than $1.1 billion in 2012. The opportunities are there for marketers, brands, agencies and particularly local lead generation companies. The Millenial Media study listed "opt-in" or list building as the most likely goal for Q4 2009 mobile campaigns.